Showing Off My (Winter) Shoulders with EYMM’s Pretty Dress! Winter isn’t always about covering up. We have recently moved off a ski hill into town. It’s about 60km, a 900m descent in elevation, and a 5 – 10c increase in temperature. Consequently my wardrobe, while needing a seasonal change, doesn’t warrant the oodles of thermal layers I have become accustomed to wearing over the last few years. When Everything Your Mama Made and More (EYMM) announced another Blog Tour I thought – Hey, I can actually show more than my nose peeking out! I jumped on the bandwagon and here I am. Photobombed by a Stuffed Moose! The Off the Shoulder Dress and Peplum is, quite frankly, a beautiful design, and like all EYMM patterns comes in a huge range of sizes. My size seems to have increased over the last few years. A friend told me that when you get to your 50’s your waist leaves town. I’m not sure where its gone but it keeps increasing along with the years. Maybe it’s trying for a sympathy vote? Regardless, I had to merge sizes for my waist which was easy as I could choose which sizes to print off. I asked nicely and was sent the A0 file for my printer; no printing and taping for this woman. I’m taller than normal and added 2″ to the sleeves. I made the dress, but cut the peplum bodice length as my dress length (another 2″), I then made the skirt as long as my fabric measurement allowed. Not exactly rocket science but a good way of getting maximum use of all the fabrics I have. The design is a fabric hog though, and what do you do when you have a lot of knit fabric but its all in 1 – 2m lengths? … and the total dress fabric requirements are up to 4.5m? Well, you look at creative ways to attach pieces of fabric without it looking like you’re a fashion disaster! It seems everyone loves Chambray, but the washed out blue does very little for me. The dress has an option for a gathered or circle skirt. The top, cowl and sleeves are from knit fabric (it helps with pulling it over the head); the circle skirt need knit for the stretch factor over the waist and hips, but the gathered skirt can be woven On my skirt I attached a knitted top to a woven bottom part. The colours are close enough for it not to look like a patchwork, while the heavier woven fabric allows it to swish and lift when I walk and twirl. Lets face it, who doesn’t like a bit of a twirl? Careful pinning. Even more careful sewing. I used a lovely Simply Rylee mixed ‘Surprise Box’ off white jersey for the cowl. The photos really don’t do it justice as the fabric is simply soft and divine. The cowl, by the way is huge! But it looks so pretty and lays so nicely. I’ve been dubious of cowls since I made one that was so heavy it kept pulling my top down and showing off my cleavage. This one isn’t like that at all. It could be the fabric, but I think its the design. It’s shaped like a long hourglass and I suspect that is the secret (along with the clever pleating) to it staying in place and looking so lovely. I love the cowl. It will also lay as a one shouldered style if required. The dress came together easily; instructions were concise and well written. I sew slowly and carefully, and even taking my time, I made this is a week. I always trace off my master pattern until I know what size I need. Apart from my standard EYMM alterations I was good to go with this pattern. I used my trusty Serger for the majority of the sewing. I love how it finishes the seams on ravelling fabric. I also used my regular machine with a wooly nylon thread in the bottom for the cowl construction. I always sew knits in my serger with wooly nylon in the loopers. It leads to many less popped seams. While I now bypass the ‘Knits 101’ section on the patterns, it is nice to have them there for anyone needing support or a refresher. EYMM has donated a $20 store gift card to me to give away. While I don’t have a daughter I think this is a lovely design for adult or child; especially so for the Tweens. If you’d like to enter the giveaway please submit a comment on my blog. I shall randomly choose a winner on December 16th. Please ensure I have your email in order to contact you! Eeyore wants in the photo too! In the meanwhile follow the link to check out the other blog posts. We all made the ladies’ version, but the children’s version looks lovely too. I wore mine out today to a party, and received many unsolicited compliments. I also twirled like 5 year old. Yes, a little girl in your life will quite possibly love this. 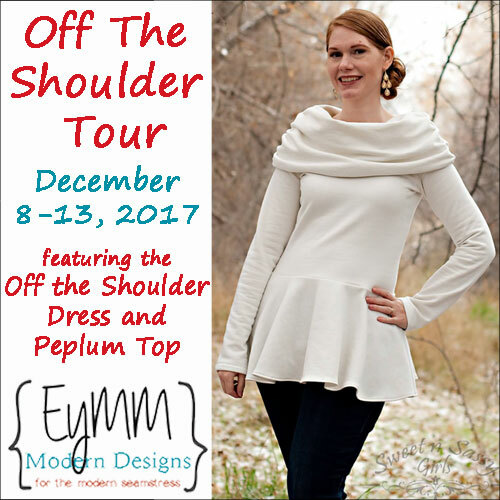 Grab yourself a copy of�the pattern�while it’s on sale during the tour!�The�Women’s Off the Shoulder Dress & Peplum Top�AND�the Off the Shoulder Top & Tunic for Women or Girls�are all�25% off (no coupon needed, prices as marked) in the�EYMM shop�until 11:59pm PST on�December 14, 2017. Finally, thanks for stopping by. I didn’t receive any compensation for participating in this blog tour as I already owned the pattern. I do, however, feel stunning in such a pretty flattering dress. Thanks EYMM! I shall make more of these; maybe in time for Christmas!